Liberty Tax Service is the fastest growing international tax franchise ever with over 3,200 offices in Canada and the United States. At Liberty, our specialty is computerized tax preparation coupled with unparalleled customer service. Our proven operating system is lead and finely tuned by a leadership team whose tenure totals over 600 years in the tax industry. In eleven years, Liberty Tax Service has grown to the size it took the other national tax franchises 15 years to realize. Liberty Tax Service Founder and CEO John Hewitt remains an influential icon in the tax industry, nationally recognized as an entrepreneurial visionary with a blueprint for tax industry success. He's been recognized for four years as one of Accounting Today's 100 most influential people in the accounting industry, and was the 2003 Virginia recipient of the annual Ernst & Young Entrepreneur of the Year Award. Hewitt is carving out a niche in the tax industry by coupling unparalleled customer service with tax technology, and offering a tax franchise opportunity that is ranked by Entrepreneur for excellence, affordability, and solid growth. 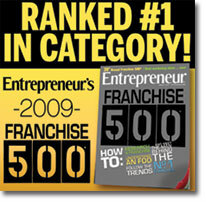 This year, Entrepreneur magazine has ranked Liberty Tax Service® the #1 tax franchise, and #3 overall on its "Franchise 500" for 2009. What other industry offers the perpetual product of tax preparation, and a growing market even in sluggish economic times? Not only are there more taxpayers, but the number of taxpayers opting to pay a preparer is also on the rise. Ten million Canadians electronically filed their taxes through a professional tax preparer this year. That's an increase of 14.1% over last year. Unlike many industries, the tax industry arena has been dominated for over 40 years by only one major competitor, H&R Block. In raw number of return growth, Liberty has beaten H&R Block from 1998-2004 in both the U.S. and Canada. Our total number of returns prepared increased over 60% from tax season 2003. Our same store sales were up by 25%. Join forces with Liberty Tax Service, and put the power of the fastest growing international tax franchise ever to work for your success! We're building the number one tax franchise team in the industry. Liberty Tax Service is a proven franchise operating system with low start-up costs and high returns. We will help you implement your business plan and support your efforts as you grow your income tax franchise business. It's the easiest and most cost effective way of being your own boss and taking control of your financial future! Be Your Own Boss. No Tax Experience Necessary. Are you serious about success? Do you have an entrepreneurial streak? Then Liberty Tax Service could be the ideal franchise business opportunity for you. An increasing % of the tax paying population pays someone to do their taxes each year. That is only expected to rise as the tax code gets more complicated. Wouldn't you like to get in on some of that growth? We are led by International Franchise Association Entrepreneur of the Year, John T. Hewitt. With 41 years of experience in the tax preparation business, he has led Liberty to open 3,300 offices in just 12 years - more than three times faster than any tax company EVER. The Liberty Tax franchise investment is one of the most affordable you will find. It's truly a seasonal business with a double bottom line. Liberty Tax start-up costs are lower than the top ten other franchises on Entrepreneur's list of the top 500 franchises. As a Liberty Tax Service franchise owner, we will help you implement your business plan and grow your franchise business. Our franchisees work hard for four months and have the rest of the year to pursue other interests. 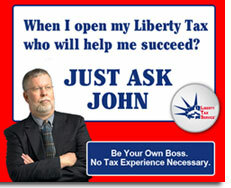 For the best small business opportunity in the income tax franchise industry, choose Liberty! Are you ready to find out more about Liberty Tax Service franchise opportunities? Click on Request Information for FREE info on how to open a Liberty Tax Services Canada franchise today! Please Note: This Liberty Tax Services Canada franchise opportunity and other franchise business opportunities, businesses and franchises for sale on this web site are not to be considered as an "offering", "franchise offering", suggestion or recommendation by Franchise Leader™. This advertisement depends entirely on the truthfulness of the information provided by our advertisers which includes, but is not limited to, franchisers, franchise brokers, franchise consultants and business brokers. Franchise Leader™ recommends that you consult a lawyer, financial consultant, accountant or professional advisor before buying a franchise or business opportunity or any type of business. By using this form or any part of our website, you have agreed to all terms and conditions of Franchise Leader™. Please review our Terms & Conditions for more information.